You may well ask what draws so many people  families with children mainly  to the newly opened archeological park in Apollonia, spectacularly located on a high cliff just north of Herzeliya. The attraction is the medieval fortress, which has been excavated since 1996. During Sukkot the halls of the castle were turned into a dress shop with a minstrel and a beautiful queen. There was also a pillory, erected on the road leading to the bridge over the moat, from which an angry knight with a French accent shouted mock abuse to the gaping public, stilts were for hire and other "French" actors-in-chainmail frolicked around with little kids with wooden swords. In other words, Medieval times are back again in Israel and they're hugely popular. It's clear that the archeological park as such is still under development. Apollonia is an ancient settlement, established by the seafaring Phoenicians, and due to it still being excavated periodically, there is a big chance that in years to come much more details and buildings will turn up. So far, here is what we know: the first settlement on the site dates to the 6th-5th Century BCE, and it was called Ashuf after the Phoenician god of war, Reshef. The city had a natural harbor and from it the Phoenician fishermen set out to fish for snails which excreted the famous red dye which was traded throughout the ancient world. This dye is also mentioned in the Bible and in the Talmud, as it was used by the Israelites. The oldest mention is in Exodus 25:4 and in Exodus 26:1, 31 and 36: red purple is used to dye the tent cloths of the tabernacle. Talmudic sources specify that the color is extracted from a living creature, and the book of Maccabees and Abarbanel in his comment on the text in Exodus state that it comes from a murex, or aquatic snail. Again, from Talmudic and other old texts we know that the dye was extremely valuable in ancient times. It was permanent in contrast to plant-based dyes which were then most common. As one snail only excreted a few drops of dye, thousands of live snails had to be caught in order to dye one single garment; hence only the wealthy could afford to dress in purple. In any case, Apollonia must have had viable means of subsistence. During the Hellenistic period, Apollonia was inhabited by Greeks who associated Reshef with their own deity Apollo, and accordingly renamed the city. It is mentioned by the Jewish historian Josephus Flavius as one of the coastal cities that are ruled by the Hasmonean king Alexander Janneus (Antiquities of the Jews 13:4:395). The city was extended during the Roman period. It is thought that Apollonia had a Samaritan community, and maybe there were also Jews who lived here, possibly extending to the Byzantine period (no synagogue has been found as yet). During the latter, the name was changed once again, to Suzassa. During the 5th and 6th Century CE the city reached its greatest prosperity; it even became the main port city of central Israel. It had a wine and olive industry and also produced glassware. Its Christian inhabitants were serviced by a big church. It had an intricate water system of which numerous features are still to be seen in the park. The Muslims, who next conquered the city, were the first to surround it with a wall. Its purpose was to ward off the Byzantine fleet. 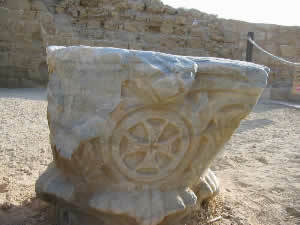 The Muslims restored the city's original name, Arsuf. Several centuries later, however, they came under attack from the Crusaders, who by 1099 ruled Jerusalem. They made several attempts until in 1101 King Baldwin I finally succeeded. He donated the city to the noble French family of Arsour and they gave it their name. From that time Arsour became a point of strife between the Crusaders and the Muslims. Further fortifications were necessary. 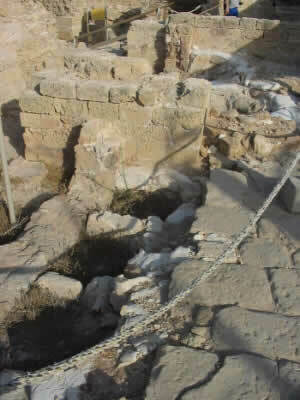 The Crusaders strengthened the walls and dug a moat around the entire city. In 1187, nonetheless, the Muslims acquired the city back after the Crusaders were defeated in the battle of Hittin. But it was only for four years. In 1191 the Crusaders got it back in the Battle of Arsour. In 1241 the Arsour clan began building the fortress. After the father, Jean d'Ibelin died, his son Belian continued the task. But they were attacked constantly by the Mameluks and Belians lacked the resources to deal with them. His solution was to grant Arsour to the religious order of Hospitaller Knights, who manned the fortress with a couple of hundred soldiers. 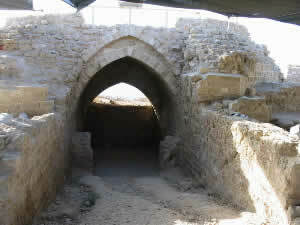 In 1265 Arsour was again attacked, this time by Sultan Baibars, who laid a siege around the fortress. The Crusaders lasted out for forty days, but then, seeing there was no hope that they would come out alive, surrendered. Even though Baibars agreed to let them free, upon entering he forced them to burn and destroy the fortress, including its harbor, and subsequently took the Crusaders prisoner. The Mamelukes established an outpost but it was eventually abandoned and that was the end of the city's history. From the entrance, the path walks along the 9 meter-wide moat around the city. A bit further, it ascends and continues on the ancient city wall, made of kurkar blocks and cement. By the way, entrance to the city was not here, but on the east side of the city, which lies in the area that is not yet incorporated in the park, although it is already designated as such. The city gate was probably reached over a wooden bridge, similar to the bridge over the moat to the fortress, of which remains can be seen further on. 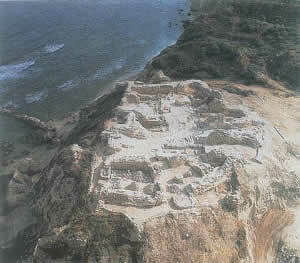 Outside the wall, a Roman villa from the first and second centuries CE was excavated, which can be studied from above. It has the familiar pattern of a central courtyard with rooms around it. Along the sea path several remains of the Byzantine water system are exposed. Rain water was collected in round or square cisterns and led to the required places through pipes. The Crusader fortress is already in sight from here, commanding the highest part of the tel or cliff, some 30 meters above sea level. On its three sides that are not protected by the sea it is surrounded by a 30-meter wide moat. It has a triple system of walls, made in the same way as the city wall: with trimmed kurkar stones fortified by cement. 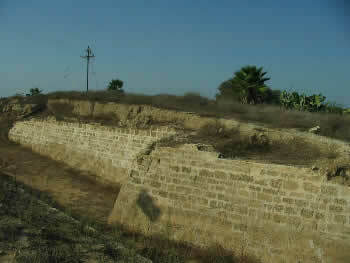 From across the moat, damage to the fortifications from its last battle against Sultan Baibars is quite evident. There are holes in the walls and rubble has fallen down. The Mameluke forces tried to approach the fortress by filling the moat with wooden beams on which they could ride their siege machines from which they shot ballista stones and arrows. 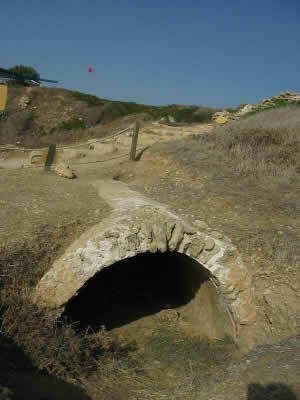 They also dug tunnels from which to fire on the fortress. The Crusaders used similar counter techniques: in the fortress large heaps of neatly numbered ballista stones have been piled up as witness to what must have been quite a fight. Note that the bridge over the moat lay more to the west than the current visitors' bridge (there are some protrusions that denote the bridge). After crossing, one had to walk along the outer wall until reaching the gate. The outer wall had five semi-circular towers. Then there was a second wall, slightly higher that the outer wall. Behind that there was a keep, or watchtower. One enters the fort through the inner gate, treading on pavement of stone slabs which are found on more places in the fortress, and a threshold with horizontal marble pillars in secondary use. In the gatehouse, which would have reached two stories and was closed with wooden doors, were benches on both sides. It was sided by two semi-circular towers. On both sides of the gate there are halls, with semi-circular ends which would have carried towers. Opposite, across the paved courtyard, stairs led down to two underground chambers which led out to the harbor. On the left, decorated column bases are displayed on the floor and the beautifully cut stairs lead to the platform of the keep. 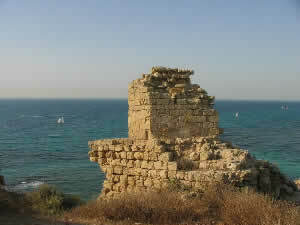 From it, the view stretches from Jaffa in the south to Caesarea in the north. Two remains of towers protrude to the sea. 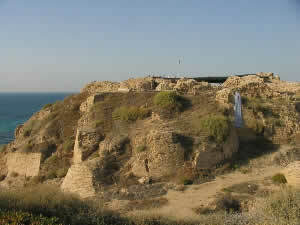 The remains of the Crusader port can be seen in the depth. It's not in a good state. A comparatively new branch of marine archeology has found in recent years that the harbor and kurkar coast are subject to rapid erosion. This is so serious that scientists estimate that within a few decades the entire coastal city of Apollonia and also other ancient coastal cities will simply waste away. Currently, the National Parks Authority together with other bodies are trying to rescue as much as possible. The natural destruction is also a bit of a boon, as many objects have washed up from the numerous ships that have been wrecked on the treacherous Mediterranean coast. Some of the objects include fishing devices: net-sinkers, sounding leads; there were also pot shards from Persian and Byzantine jugs and amphorae, glass ingots (from the Apollonia glass workshop), gold coins, Mameluke candlesticks, bronze door decorations, Hellenistic arrowheads, clay and bronze figures of pagan gods, for instance one of the Roman goddess Minerva, and a cargo of basalt mill stones, probably meant to be exported before the ship went down. Besides the spillage from wrecks divers also retrieved about 50 stone and iron anchors, the oldest one dating to the Middle Bronze Age; it is thought that before the harbor was built ships anchored on the kurkar ridge, lying submerged before the coast. Looking the other way there is of course a good view of the fort. There are further halls and facilities to visit. All of the rooms used to have a second story with vaulted roof, used for the soldiers' sleeping quarters. To the north lies the kitchen area. There are five pits for stoves and two pools and a water channel. There is also a large domed storage chamber, probably for grain. Its floor and also the floor of the room next to it have embossed grinding stones, apparently for grinding flour. The dining hall close to this seated the Crusader knights and soldiers. 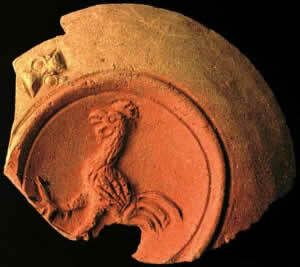 Many bowls and decorated glazed plates were dug up. The south chamber is coined the Burnt Room. Parts of the walls are splotched with black. 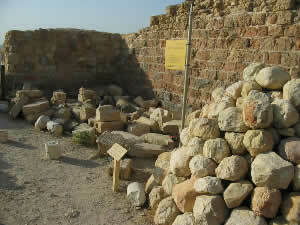 Tumbled columns and stones from the walls, in addition to the ballista heaps, are lying scattered as evidence of the Mamluke destruction.